October 4, 2007. Vol. 1, No. 6. Did Texas Sell T. Boone Pickens Powers of Eminent Domain? A political shopping spree may have accelerated the efforts of Dallas billionaire T. Boone Pickens to hijack sweeping government powers of eminent domain. The tycoon wants these extraordinary powers to benefit his private utility companies: Mesa Water and Mesa Power. The $1.8 million that Pickens spent on Texas’ last two elections made him the state’s No. 5 individual donor—up from No. 12 in 2002. Pickens wants condemnation powers to lay 320 miles of utility lines from suburban Dallas to the Texas Panhandle—with or without the approval of the owners of the private land that he would excavate. In their very next session, however, lawmakers enacted legislation that helped put these expansive powers in Pickens’ hands. With Pickens spending up to another $1 million on state lobbyists this session, not a single lawmaker of either party voted against the legislation, which now is the law of the land. Pickens made an initial fortune through his Mesa Petroleum, which expanded through aggressive buyouts of other energy companies—including those much larger than Mesa. Pickens later founded BP Capital, a hedge fund specializing in energy trades. His most recent venture, Mesa Water, seeks to make a fortune off the “new oil” through water rights he has purchased in the Texas Panhandle. The vehicle for Pickens’ related land grab is a state water law that allows a handful of people to form a so-called “fresh water supply district.”3 These districts wield the power to condemn private land for infrastructure far beyond their own borders. In this way, a Pickens-controlled district covering eight square miles in the Panhandle is on the verge of acquiring the power to condemn private land for a pipeline all the way to Dallas. Such districts also are authorized to raise cheap money by issuing tax-exempt bonds. Although the legal requirements to form such a water district already were minimal, this year the legislature watered them down further. Going into the 2006 election that preceded this legislative fix, Pickens personally contributed $1.2 million to state candidates and political committees. Recipients of his largesse included each of the 16 senators who faced election in 2006 and one-third of the 150-member House.4 Republicans received 94 percent of all the money that Pickens doled out to state candidates (see Pickens’ contributions in the appendix). Pickens spokesperson Jay Rosser said in an interview that there is no connection between his boss’s political activity and the recent changes to water-district law. “We weren’t behind the changes in legislation,” he said. 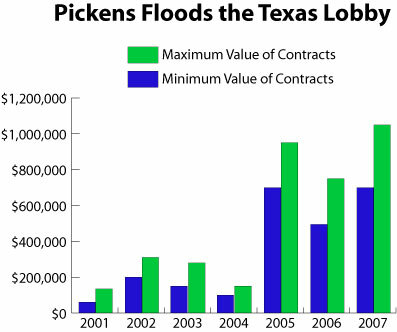 Rosser said the increase in Pickens’ Texas political contributions mirrors an increase in Pickens’ net worth that also has been accompanied by major increases in his charitable contributions. In May, for example, UT Southwestern Medical Center in Dallas and the M.D. Anderson Cancer Center in Houston each received $50 million checks from the recently formed T. Boone Pickens Foundation. Rosser did not dispute, however, that the water district that Pickens is seeking in the Panhandle would not have been viable without the recent legislative changes. Until last month, petitions to create a water district required the support of a majority of the registered voters within the proposed district’s borders. Changes enacted this year dropped this electoral requirement for a more feudal one. Now a district can be formed with the backing of whoever owns the majority of the appraised land value within its proposed borders.5 Similarly, the 2007 legislature revoked a requirement that only local registered voters could serve on the boards of these water districts. Now any Texas resident who owns property in the district can sit on the board.6 The newly relaxed requirements for board members seem particularly advantageous to Pickens. Six weeks after Governor Rick Perry signed the new water-district rules into law, Pickens sold a total of eight acres of his sprawling Mesa Vista Ranch in the Panhandle to five people who depend on him for their livelihoods.7 Three of these buyers are Pickens company executives who live hundreds of miles from the Panhandle parcels that they bought from Pickens. The only local buyers were Alton and Lu Boone (no relation to T. Boone Pickens), who manage Pickens’ ranch near the town of Miami in Roberts County. of the district on November 6, 2007. A Pickens attorney then filed a petition with Roberts County Commissioners on August 6 to create a fresh water supply district to be confined to the eight acres of land that Pickens sold to his associates three days earlier.8 Although this petition was filed before the weaker rules governing water-district petitions took effect on September 1, this petition would not be viable without the legislature’s recent changes affecting water-district boards. Fresh water supply districts previously had to be governed by boards that consisted of five locally registered voters. Pickens’ pending petition boasts only two people who meet these qualifications: Alton and Lu Boone. Thanks to the legislature, however, these qualifications for board members changed on September 1. Now any state resident who owns property within the district can serve on the board. This opened the door to the three Pickens executives who recently bought land within the proposed district but live hundreds of miles away. Acting on Pickens’ petition on September 4, Roberts County Commissioners voted 4-1 to hold an election on November 6 on whether or not to create the proposed water district. Apparently, the only people who will decide the outcome of the upcoming water-district election—that could affect millions of Texans—will be Alton and Lu Boone.9 Such a democratic farce could make a tinhorn dictator blush. (Will the county hold a runoff in the unlikely event that either Alton or Lu Boone vote against the express wishes of their patrón?) Yet this farce allows Pickens to leverage broad governmental powers—condemning land and issuing municipal bonds—without any semblance of governmental accountability. 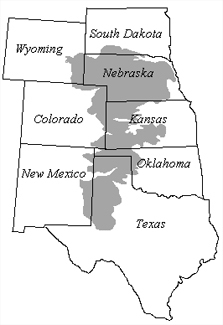 The Ogallala Aquifer covers parts of eight states. Pickens’ ranch and the proposed water district sit on the vast Ogallala Aquifer, which covers parts of eight states. Since electric irrigation pumps became widespread in the late 1940s, the Ogallala has lost an estimated 11 percent of its total volume.10 Due to its notoriously slow recharge rate, little of its water is replenished. Most of the aquifer’s water has been there since the last ice age. This round Pickens is better positioned. In addition to benefiting from the legislature’s newly weakened requirements for water districts, Pickens has sweetened the deal by promising a substantial public benefit. The new plan calls for investing $10 billion to build the world’s largest wind farm in the Panhandle.13 The 320-mile water pipeline that Pickens has proposed building over private land would include power lines to transmit clean wind energy to the smog-covered Dallas area. “At some point, portions of Texas—such as the Dallas Metroplex—will face critical shortages of energy and water,” says Rosser. Pickens’ project is a way to meet these critical public needs. Yet Mesa Water also has said that the pipeline will allow it to legally extract up to 200,000 acre-feet a year from the Ogallala Aquifer. The indulgent pumping limits set by the Panhandle Groundwater Conservation District would permit the loss of half of the aquifer’s remaining waters by 2050 in order to feed the metropolitan area that leads the state in per-capita water consumption. 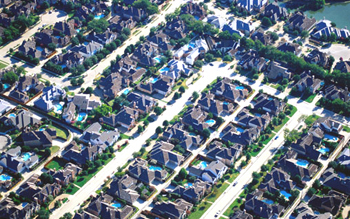 Arial view of houses in the Dallas area. Getty Images. Texas has an urgent need to develop clean energy sources such as the wind farm that Pickens has proposed. Yet other companies are pursuing wind projects here and other tycoons—including Warren Buffett and the Hunt family of Dallas—want to string new transmission lines across the state.14 Texas can offer private investors a solid return on clean-energy investments without granting broad powers of eminent domain to a water district in a tycoon's pocket and without gutting one of the world’s largest aquifers. Texas can make better deals on much better terms. It should. 1 This followed the Texas Legislature’s passage of SB 7, which sought to reverse the effect of the U.S. Supreme Court’s controversial 2005 decision Kelo v. City of New London. 2 “Speaker Craddick appoints Rep. Beverly Woolley as co-chair to the Interim Committee to Study the use of the Power of Eminent Domain,” Texas House news release, October 14, 2005. 3 This authority stems from a 1919 statute created to finance drainage projects. 4 Pickens also gave money to most of the 16 senators who did not face a 2006 election. The all-Republican exceptions were: Robert Duncan (Lubbock), Troy Fraser (Horseshoe Bay) and Kel Seliger (Amarillo). Seliger’s district includes Roberts County, where Pickens seeks to create his water district. 5 See HB 2983 by Rep. Brandon Creighton (R-Conroe) and the identical SB 1179 by Sen. Glenn Hegar (R-Katy). The law also requires the backing of at least 50 people owning land inside the district if there are 50 landowners there. This is not the case in the district Pickens is pursuing in the Panhandle’s Roberts County. 6 See HB 2984 by Rep. Brandon Creighton (R-Conroe) and the identical SB 1178 by Sen. Glenn Hegar (R-Katy). 7 The New York Times reported in 2003 that Pickens owned 121,685 acres of rural land in Texas and Oklahoma and that his Mesa Vista home covered 22,000 square feet. “A Takeover Artist’s New Target Is Land, New York Times, October 5, 2003. 8 The so-called “Roberts County Fresh Water Supply District No. 1.” See “Pickens proposes Roberts County water district,” Amarillo Independent, August 30, 2007; “Kaufman County won’t vote on Pickens’ pitch for freshwater district,” Dallas Morning News, September 5, 2007; “Billionaire’s Power Play,” The Bond Buyer, September 9, 2007. 9 While T. Boone Pickens himself is registered to vote in Roberts County, he no longer owns land within the proposed water district. A month before the election, Roberts County officials said they had determined that Alton and Lu Boone were eligible to vote but they had not decided if T. Boone Pickens himself would be eligible. Pickens spokesman Jay Rosser said that his understanding is that just Alton and Lu Boone would vote. 10 See “Water in Storage and Approaches to Ground-Water Management, High Plains Aquifer, 2000,” U.S. Geological Survey, Circular 1243, pages 32-34. 11 The City of Amarillo separately bought rights to 72,000 acres of water in 1999 from Roberts County landowners led by Mood Land & Cattle Co.’s Salem Abraham. 12 Opponents challenged the first district that Pickens proposed by petitioning the county to form a rival, countywide district that would be democratically controlled. After this challenge, the Pickens group withdrew its first petition in 2003. 13 Pickens has proposed building up to 2,700 turbines over 200,000 acres to generate 4,000 megawatts of electricity. 14 See “Buffett, Gates, Pickens May Profit From Texas Power Shortage,” Bloomberg News, September 17, 2007.